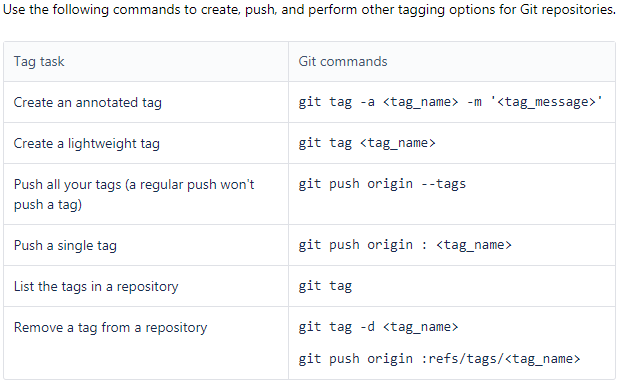 How do you delete a Git tag that has already been pushed? Pushing a branch, tag, or other ref to a remote repository involves specifying "which repo, what source, what destination?" By omitting the source ref (the part before the colon), you push 'nothing' to the destination, deleting the ref on the remote end. See Adam Franco's answer for an explanation of Git's unusual : syntax for deletion. Now go to Github.com and refresh, they disappear. After reading through these answers while needing to delete over 11,000 tags, I learned these methods relying or xargs take far too long, unless you have hours to burn. This first method is by far the fastest, maybe 20 to 100 times faster than using xargs, and works with a least several thousand tags at a time. How does this work? The normal, line-separated list of tags is converted to a single line of space-separated tags, each prepended with : so . . . Using git push with this format tag pushes nothing into each remote ref, erasing it (the normal format for pushing this way is local_ref_path:remote_ref_path). After both of these methods, you'll probably want to delete your local tags too. This is much faster so we can go back to using xargs and git tag -d, which is sufficient. The other answers point out how to accomplish this, but you should keep in mind the consequences since this is a remote repository. The git tag man page, in the On Retagging section, has a good explanation of how to courteously inform the remote repo's other users of the change. They even give a handy announcement template for communicating how others should get your changes. Here is a method which is several times faster than xargs and may scale much more with tweaking. It uses the Github API, a personal access token, and leverages the utility parallel. parallel has many operating modes, but generally parallelizes any command you give it while allowing you to set limits on the number of processes. You can alter the --jobs 2 parameter to allow faster operation, but I had problems with Github's rate limits, which are currently 5000/hr, but also seems to have an undocumented short-term limit as well. After this, you'll probably want to delete your local tags too. This is much faster so we can go back to using xargs and git tag -d, which is sufficient. Simple script to remove given tag from both local and origin locations. With a check if tag really exists. Create shell script file (e.g. git-tag-purge.sh) and paste content. chmod your script file to make it executable. Seems like a lot of work for something xargs already does. Looking back through this thread, I'm guessing the slowness with xargs that you experienced is because the original answer used xargs -n 1 when it didn't really need to. The above uses a maximum of 5 processes to handle a maximum of 100 arguments in each process. You can experiment with the arguments to find what works best for your needs. In the verification window, select "Remove Tag From Remotes"
YOUR_TAG_NAME will now be removed from your local repository and all remotes - be it GitHub, BitBucket, or wherever else you listed as a remote for that repository. Also, if you deleted a tag locally but not on the remote origins, and you want to delete it everywhere, then just create a new tag that has the same name and is attached at the same commit as the origins. Then, repeat the steps above to delete everywhere. If you have a tag created starting with the # character, e.g. #ST002, you might find that u are unable to delete using normal patterns. i.e. That will get it deleted. Hoping it will help someone who made the mistake of using # to write tag names. ~/p/gittest $ git commit -m "initial commit"
How do you delete a remote annotated tag? How to delete Github Tag forever? How can I delete a remote tag in eGit?